Last night MM (husband) said he loved eating at the table. I asked him why and he said it was because it felt like that’s what families should do. We were just having take-out pizza but we had set the table, which I think makes a meal feel more like a meal and less like just eating. When we don’t sit there, we park it around the island because we’re doing something quick or we’re just too lazy to walk the 10 extra feet to the dining room. Two years ago we made the decision to turn the formal dining room into something more useful–a dining room we’d actually use. The table we had in there previously had been my parents’–a very chunky 1960s’ octagon style that was petite and pretty with the slip-covered chairs. This is the "before" essentially--I loved those slipcovers but it didn't make sense for every day. The room was a typical formal dining room, used three or four times a year and as a buffet when we had less formal gatherings. The heaviness of the chairs, not to mention the white fabric, were not a good option with two young children. 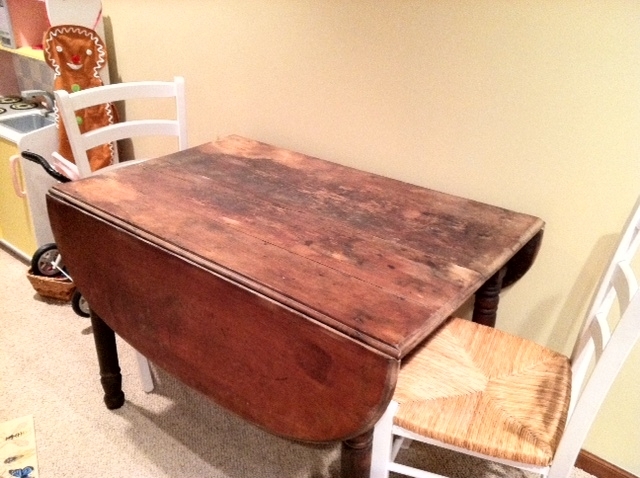 I gave the table and hutch to my sister and we lived with a table cloth-covered, plastic banquet table for several months while a search for the perfect table ensued. In my mind, the perfect table consisted of something round and sturdy with a top that could stand up to lots of spills, banging forks and sweaty cups without coasters. I looked at those ones made from Canada with the wood that is supposedly impervious to stains. The one I picked out was like $1800 and I wasn’t completely sold on the look. From the Canadel web site. This isn't it exactly but you get the picture. Also, my sister, who owns one, reminded me that the wood still chipped if a certain one-year-old banged his utensils on it. So, I moved on. Next I thought about an antique–something that had already been lovingly used and worn. My family could just add to the love. I didn’t like the look of the typical oak ones I found most but I found this Walnut one tucked away in an antiques booth. It's a dog but Steve is very convincing. It wasn’t round but slightly oval with its drop leaves open. It was in poor condition and looked as if it had spent some time either outside or in a shed. My friend Steve, a former antiques dealer and consummate salesperson, convinced me it would be the perfect table “once it was cleaned up” and promised he’d buy it from me if it didn’t work. I spent $120 on the table and another $250 having it cleaned up but “not too clean. Leave the patina,” I instructed my wood guy. When I picked it up, and Steve wasn’t with me, the wood guy told me to sell it to Steve. After the drop leaves dropped twice as we were eating on them, I relegated it to a game table in the basement and ate crow with MM for wasting the money. Strangely, Steve seemed less interested in the table once it was dropping dishes at my house. So then we were back at the plastic banquet table during Thanksgiving and I mentioned wanting a round table to my mother-in-law, Rita. Remember, Rita lived in this house and had her own table in this very dining room for 35+ years. She’s been very good over the years about not criticizing my changes (I think she’s thankful that we cleaned it up so much) but she is a typical mother-in-law with opinions. She did agree that a round table was a good option and mentioned that her mother always lamented getting rid of her own round table. The very next day, in the midst of the annual Christmas decorating chaos, Rita called to announce that she had found us THE table. MM was on the phone saying, “No! Don’t buy it! We’ll try to get there, Mom, but it’s a crazy day.” He was rolling his eyes. This was not the first time that she attempted to buy something for us that she thought we needed. When he got off the phone, he just sighed, “Well, my mom found us a table at the Salvation Army and they’re having a 25% off furniture sale today.” I laughed but admitted that I wasn’t above buying it there–I’d been scouring Craig’s List and antique stores after all. We both doubted it was going to be “our taste” but decided to check it out because we were headed in that direction to cut a Christmas tree. Well, this time Rita scored. The table was gorgeous in every way. 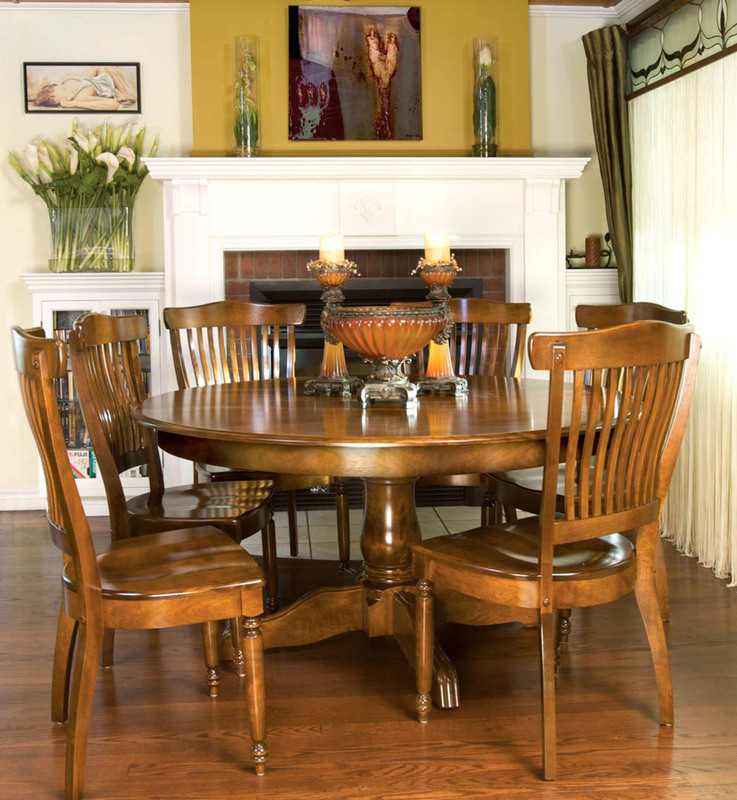 It was cool too–called a Perimeter Table, it has banana-shaped leaves that make it a larger round instead of an oval. When all of the leaves are in, it comfortably sits 10! We loved it and for $178, we loved it even more. The Salvation Army table. I already owned the chairs, but they match awesome(ly). Now it is almost black and it does show the nicks because the now three-year-old does bang his utensils, but I’m getting better at overlooking that. I like to think of every nick and scratch as our patina–us showing the love and using a dining table how it’s supposed to be used–for dining. I like the table and chairs! 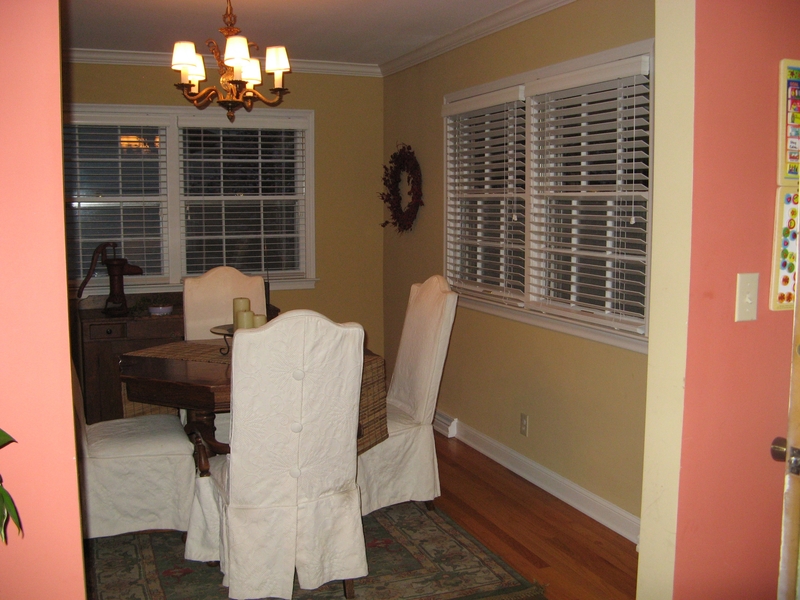 I think a more casual dinning room is a perfect idea, plus it’s way more kid friendly! 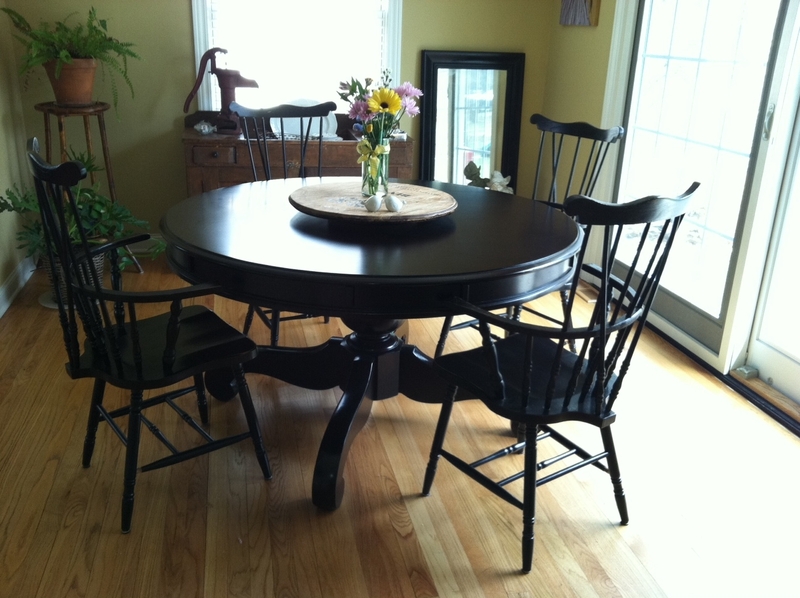 I recently bought five dinning chairs from goodwill that I plan to paint black and distress. Your table story is my favorite and I love that you use the rack for your shoes! The blog is a fun read. Creative indeed!